While global headlines might focus on Ebola, the zika virus or yellow fever, we are slowly winning the fight against infectious diseases. They will remain a challenge for decades to come, yet the real threat of the future is expected to come from elsewhere: non-communicable diseases (NCDs) such as diabetes, cardiovascular disease and cancer. 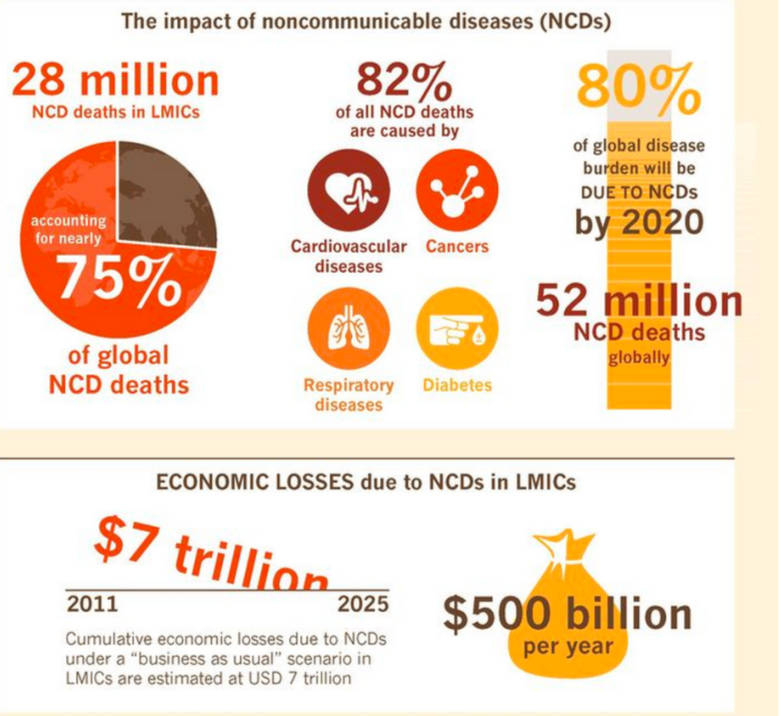 It’s likely that soon NCDs will kill more Asians than infectious diseases like HIV, TB and malaria. In fact, the World Health Organization (WHO) estimates that by 2030, the death toll from NCDs will equal that of malnutrition, maternal mortality and communicable diseases combined. Urbanization, adoption of unhealthy lifestyles and greater prosperity will be the major drivers of this new epidemic, says the WHO. And more than 2 billion people still lack access to essential medicines. Many Asian – including ASEAN – governments recognize the threat and are doing much to combat the rise in NCDs by educating the public about the risks of poor diet and physical inactivity, as well as excessive alcohol and tobacco consumption. But while prevention is critical, the World Bank has stated that care and treatment of NCDs will inevitably become a much larger part of Asia’s healthcare expenditure. We must find creative new ways to tackle these health challenges, which will call for us to pool resources and expertise from all those involved in the delivery of healthcare. I believe companies share the responsibility for being part of the solution, but they also need support from governments, civil society and other organizations to ensure the greatest impact. It’s something we will discuss in detail at the World Economic Forum on ASEAN in Kuala Lumpur in early June. There are already several models pharmaceutical companies can pursue in order to help Asia fight the threat of non-communicable diseases, each of which have their strengths and weaknesses. Philanthropic drug donation programmes have been successful in fighting some diseases, such as leprosy. They work best when seeking to eradicate (or near-eradicate) a particular disease, but it’s not generally a model that works with most NCDs. It also forces countries to become dependent on priorities established by donors, making it difficult for them to secure adequate national funding for health services. This model has been used a lot in the treatment of HIV/Aids, and has been proposed as a potential approach for NCD treatments, sometimes via complex “patent pooling” models. The main issue is that it can leave supply in the hands of local generics companies, whose prices can fluctuate substantially over short time periods and whose ability to supply vast Asian markets reliably has been sorely tested over the past decade. In this model, health systems pay for treatment according to their ability to reduce healthcare-system costs or to generate additional prosperity within the wider economy. It is a good model that I think we will start to see more of in the age of big data. Today, however, it requires highly sophisticated data collection and analysis – a challenge even for health systems in high-income countries. A system whereby richer countries pay more than poorer ones has been used successfully for decades, and is increasingly seen as an effective route forward. In Egypt, for instance, hundreds of thousands of people infected with hepatitis C are being treated with the same medicines used in high-income countries at a fraction of the cost. The main challenge is that it relies on upper-middle-income and high-income countries not freeriding by demanding prices designed for poorer countries. The philanthropic organization Novartis is developing a novel approach for lower-income countries: it uses public-private partnerships to improve the ability of local health systems to diagnose and treat NCDs. At the same time, it provides governments, NGOs and other public-sector customers access to a portfolio of 15 on- and off-patent medicines for the leading NCDs at a price of $1 per treatment per month. While this model is still in its early days – it has been launched recently in Kenya, with Vietnam and the Philippines to follow – the hope is that it can overcome the shortcomings of other approaches by embedding sustainability at its core. The aim is for it to be commercially sustainable over the medium term, enabling continuous support, and the fixed cost means health systems in the 30 lower-income countries where it will eventually be available can plan expenditure more predictably. Combating NCDs in Asia, including in the ASEAN regions, requires us to address the whole continuum of care – from prevention, screening and diagnosis to treatment. Models that might work in high-income countries will not necessarily be sustainable in environments where resources are constrained. Any innovative approach is only as good as its implementation on the ground, and we have yet to see what hurdles this new model will encounter as it is rolled out to more countries. But with all actors – whether from the public or private sector – working together, as they are doing on this programme, we’re confident that Asia will be able to tackle this next health challenge. The World Economic Forum on ASEAN is taking place in Kuala Lumpur, Malaysia from 1 to 2 June.